So, what is an off-price store? 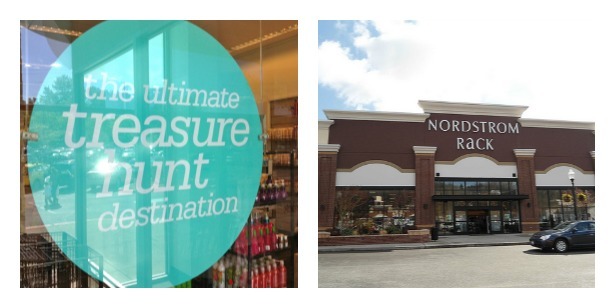 High end retailers started off-price divisions as clearance centers. Pretty much everything there came from the unsold merchandise from the mainline retailers. 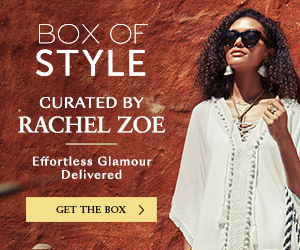 Examples :: Off 5th (by Saks), Last Call (by Neiman Marcus, which you can shop online), Bloomingdales 'The Outlet Store', Barneys New York Outlet, and my all.time.favorite, NORDSTROM Rack (or Hautelook). After those came the true off-price stores, which have no big name retailer backing them with merchandise. They had their own buyers and bought discount merchandise expressly to re-sell it as a bargain. 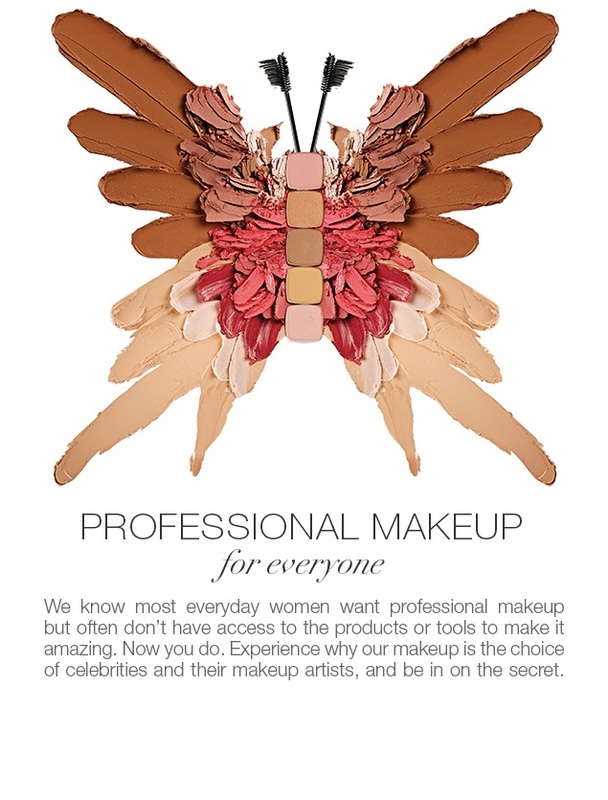 (Like T.J. Maxx, Ross, Marshalls, & Burlington Coat Factory, just to name a few). Then there are the brand name outlet stores (we've all visited a true outlet mall, right?). Similar rules to those mentioned here apply there (read on...). Even a quick 5 min loop through the store can let you know what's going on there. Plus, if you shop early in the am, the merch is all in line, store is clean, and best of all, it's generally crowd-free. I try to go at least 1-2x a month, more if I'm on a mission. I often don't buy anything, but take pictures (on my iPhone) of things I'm thinking about or hope to see at a better price later. This is probably the most important "tip". As mentioned above, off-price clearance stores that are attached to big-name retailers will have a combination of merchandise. What used to be the majority (markdowns sent from the mainline stores) is now the minority. You will find much more merchandise produced for, bought for, and already "marked down" at these stores. Most times, those items are not good (or even great) deals. I had a friend who was a clothing designer in NYC. She designed mostly juniors tops that were sold under a bunch of different labels. Some at Kohls, Target, Nordstrom Rack, you name it. But it was the same exact stuff, all with different labels! Just because you're buying it at store that says "Nordstrom" does not make it any better or higher quality than Marshalls. This is why you must know the tags! I'm not against those items, I just generally wouldn't consider buying them unless they had a second markdown on them. Those are the items generating the most revenue for the off-price stores. On the left is a "new" Rack tag. No bueno. This basically means full price. You can also look at the brand of the garment, it's often going to be a made up name you've never heard of. Many manufacturers are creating stuff exclusively for off-price stores (like a Michael by Michael Kors jacket I bought recently) that really starts at a "compare at" price. Pay attention to the brand name. It will save you a ton of time. You don't have to look at every rounder. As mentioned above, the greatest finds will be marked down items sent from the mainline stores. For example, the Savvy department is my favorite (read all about that here). 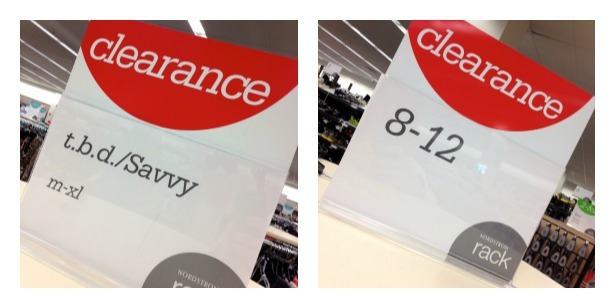 I'm also drawn to 'clearance' signage (go figure). See how the sign on the left actually says "Savvy"? That means there should be no special purchase merchandise clogging up that rack. Everything on it should be from the t.b.d. or Savvy departments. And 'clearance' on top of that (my lucky day!) The sign on the right is a regular sized rounder of 'clearance' items, probably all special purchase. Don't overlook these, I've found lots of goodness there. 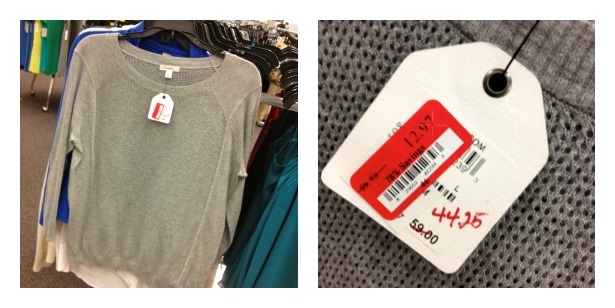 This cute grey sweater/sweatshirt is a mainline store markdown from $59 to $12.97. 78% off. Score. For someone else...I didn't buy it. 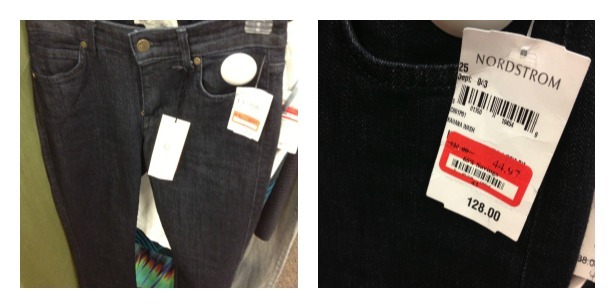 These jeans, which were really cute in person (I missed the label, sorry!) 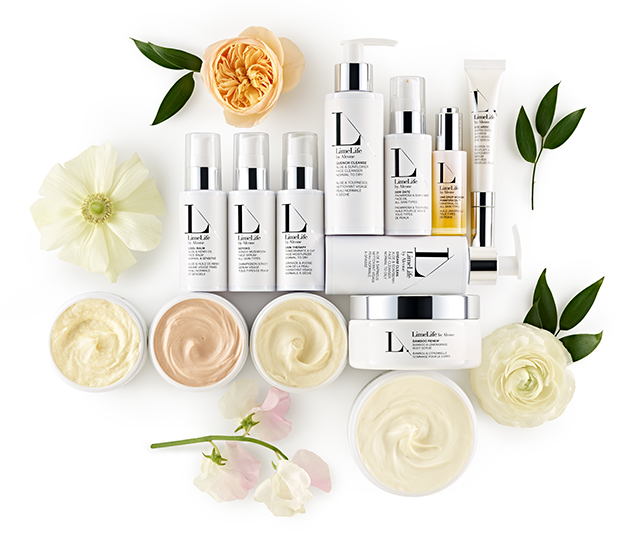 were $128 marked down to $44.97! 65% off! I didn't get any snaps of great deals on special purchase items, but I did see some. This really is key. The special events are when you'll save the most $$. When there are extra markdowns or clearance markdowns, or when they're getting a big shipment from the mainline stores. Obviously the day I went was a clearance sale and deals were to be had everywhere. 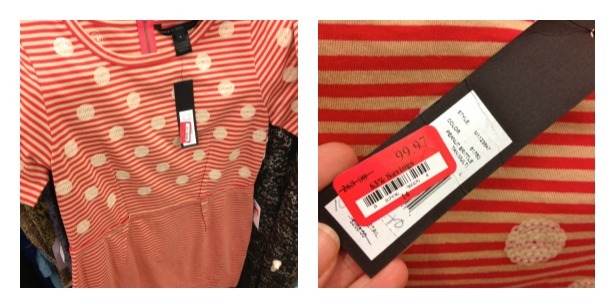 I even saw a Missoni dress at 77% off! Don't usually see Tory Burch or Equipment or Jimmy Choo at your local Rack? Keep in mind the mainline store merchandise of your Rack depends on the regional mainline stores. For example, I mostly shop at Factoria Rack, and most of their mainline store merchandise comes from Bellevue Square...which has the best selection in the area...it's the trickle down effect. Another tip is to get a Nordstrom debit card (or retail card if you can control yourself). You get points by using it (which is the same as using your bank debit card), which translate into Nordstrom Notes, actual $$ sent to you in the mail to spend at Nordstrom or Nordstrom Rack. There are double and triple point days as well, so you can get a lot more bang for your buck. 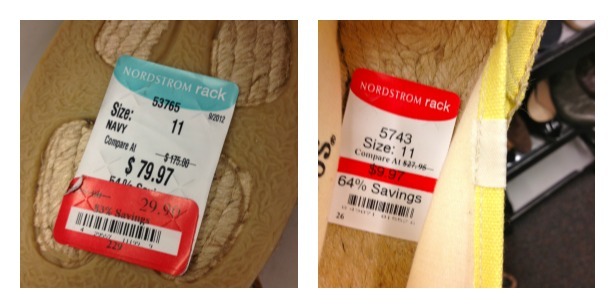 I would venture to say at least 50% of my shoes were purchased at the Rack. Seriously, I've found the most amazing deals on designer shoes. I rarely pay more than 30-40% of the retail price. Most Nordstrom Rack's will have a permanent "Designer" shoe section. It's also sized, but is separated from the rest of the shoe population. You have to check both sections. 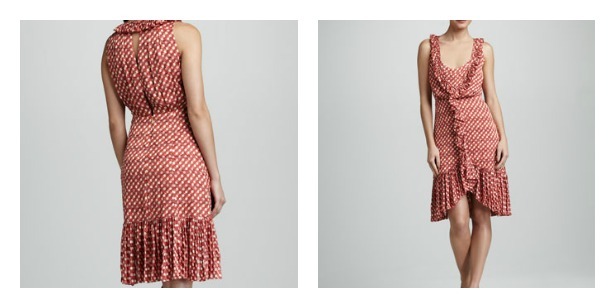 Granted the designer section is also full of special purchase, but hidden in there are some true gems. Image on the right is the "designer" shoe section for reference. 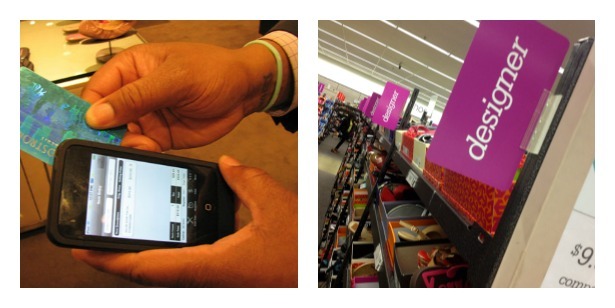 Image on the left is mobile checkout! So easy! I never wait in line at the front counter anymore. Love that! 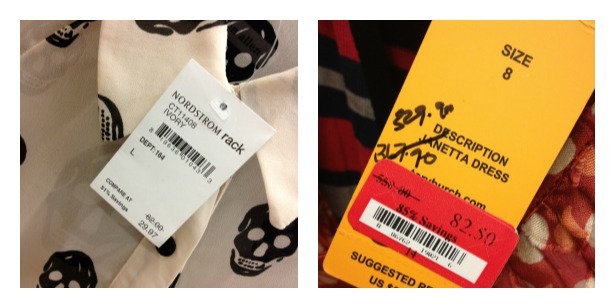 update 1/3/14 :: I've added more tips+tricks to Nordstrom Rack shopping! Read it here! Hope you can take these tips with you next time you visit the Rack. If you score a bargain, please share it with me! Do you have any other tips? I'd really love to hear from you! Comments open!! Of course I did go shopping for you. Many of these items are similar to those above...other I just liked. All amazing deals! !